The unique look of the Chinese Shar-Pei sets it far apart from other dog breeds. If you've never seen one of these fascinating canines, come take a closer look. The Chinese Shar-Pei is a very ancient breed, with references and images of it recorded as far back as the Han Dynasty in 200 B.C. This breed nearly became extinct after the communist revolution in China, but a few Shar-Pei were transported to Taiwan and Hong Kong. There they were bred in numbers just large enough to keep them from being wiped off the map. 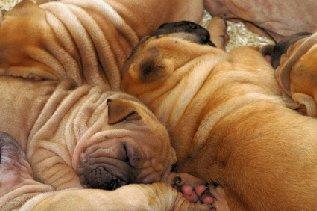 The Chinese Shar-Pei made its debut in the USA around 1966, and its unusual looks quickly garnered a lot of attention. The breed's popularity reached fever pitch in the 1980's when so many people just had to have one of these wrinkled curiosities. Since that time, demand for the breed has settled down, giving true breeders a chance to work on improving their stock. At first glance, the lovable Chinese Shar-Pei appears to resemble a wrinkly hippopotamus more than a canine. The head has a rather broad, blunt muzzle and the small eyes are hooded within wrinkles of flesh. The ears are quite small in comparison to the size of the head and are held folded over. The neck, chest, and back are also covered in wrinkles, and the tail is set high on the rear and carried curled over either side of the back. This breed shares something in common with the Chow Chow. The tongue and the entire inside of the mouth are bluish-black. This has led to some speculation that both dog breeds share a common ancestor, but no definite link has yet been found. In general, males are larger than females and stand about nineteen to twenty inches tall at the withers. Most specimens weigh in between forty-five and sixty pounds. This is a breed of substantial substance. The coat of the Chinese Shar-Pei is rather rough, the translation of its name literally meaning "sand-skin", and petting one feels a bit like stroking your hand across sandpaper. The Chinese Shar-Pei is nothing if not confident and dignified. Individuals are loyal and devoted to their human companions, but are rather reserved toward strangers. Members of this breed tend to make decent watch dogs, and are not too difficult to housebreak. They can also be trained for obedience, but do not particularly excel at agility and other high performance sports. Although they make fine companions, Shar-Pei are not really interested in performing for our amusement. Shar-Pei shed, so routine brushing is necessary to remove the loose hair. Bathing should be carried out on a bi-weekly basis, taking extra care to rinse out and dry those wrinkles. If you're looking for a high energy canine to accompany you on your adventures, you might be better off choosing a Border Collie or an Irish Setter. Although this breed enjoys its exercise, it's not particularly athletic and is subject to overheating. On the other hand, if you want a dignified, thoughtful companion who will be high on devotion and low on maintenance, then you might well find that a Shar-Pei fits nicely into your life style.